Does your hair feel gross and heavy? Get rid of your greasy scalp and hair for good by reading up on these surprising causes and their corresponding solutions. You wash your hair too much. Solution: Wash it once a day only. Shampooing once a day is enough to give your hair a nice, squeaky-clean feel. You may opt to wash your tresses in the evening to get rid of the dirt your locks have accumulated throughout the day. Solution: Apply dry shampoo on your roots. According to Live Strong, you should spritz dry shampoo on your roots in between washes to control the excess sebum production without stripping your hair of its natural moisture. You're always wearing a ponytail. Apparently, putting your hair up in a ponytail can make your mane look greasier. How? Your scalp can't breathe when the hair is brushed close to it. Also, the oil from the sebaceous glands will have a hard time spreading throughout each strand, making it trapped in between the crevices of your hair. Solution: Wear your hair down. We know it's hot AF here in the Philippines, but wearing your hair down, aka nakalugay, will benefit your scalp and tresses more than a ponytail (or a bun). It'll allow the natural oils to spread from the root to tip with ease! 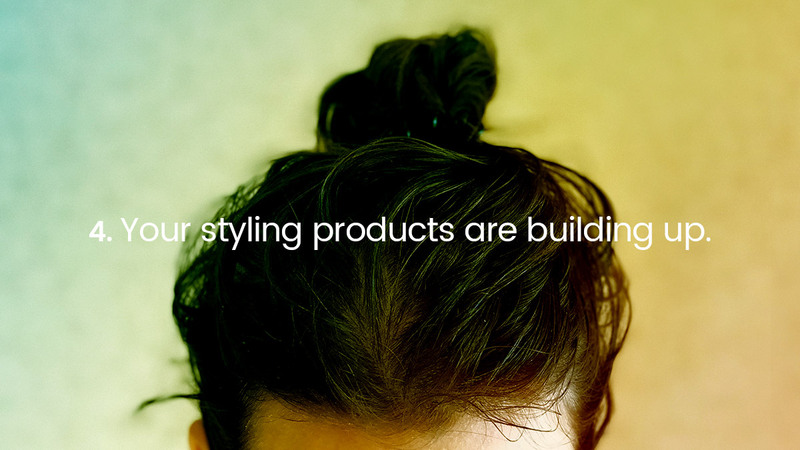 Your styling products are building up. If you're a dry shampoo addict and you usually go two to three days without washing your hair, all the sprays, serums, and shampoos would build up on your scalp, making it slick with oil. Who knew? According to Byrdie, when you're stressed, your body releases a hormone called cortisol, which drives your scalp's sebaceous glands into overdrive—causing more oil and buildup. Solution: Evenly distribute the oils by brushing your hair frequently. Instead of letting all the natural oils just collect and stew in one area, the best option is to evenly distribute them throughout your hair by brushing your locks a few times. Also, if you have five or 10 minutes, take time to meditate. Doing so will help ease your mind and lower your stress levels thus preventing your scalp from being hyperactive.